Posted on May 27, 2014 - Get free updates of new posts here. Most eCommerce companies have put a lot of time and effort into their product descriptions and many go as far as utilising ‘direct sales’ style copywriting for each and every product. This focus on products has a significant effect on the conversion rate of the website (which is good) however it also leads to neglecting other pages of the website such as the category pages. Currently many eCommerce companies do not have any unique content on their category pages which will be impeding their SEO strategy, their ability to rank for certain keywords and their overall sales success. Last week, Google launched their latest algorithm update, Panda 4.0 which targets sites or pages with low quality or thin content. Surprisingly one of the juggernauts in the eCommerce world, eBay was a big loser in this update with some reports showing that eBay lost 80% of its long tail rankings. So how did they lose these rankings? The answer is quite simple and will be something they will definitely be addressing internally at the moment – thin content on their category pages. 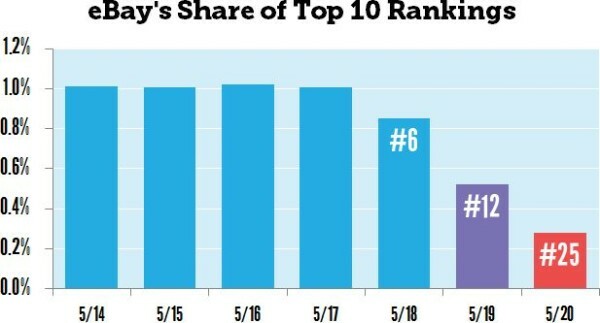 eBays recent organic ranking slide caused by thin content on category pages. One thing Google wants is to rank high quality, unique, authorities for each keyword phrase. 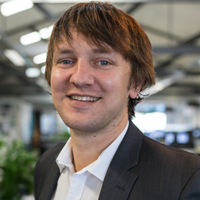 This ensures that users of Google will find the exact content they are looking for straight away – protecting Google’s market share, and more importantly revenue. There have been many studies looking at the effect of content length on a page and not surprisingly these studies have found that longer, more indepth content ranks higher than thin content. These studies and the likelihood of future Google algorithm updates targeting thin content mean you need to act now whether or not your rankings have been effected yet. A study showing content length on a page and the effect on search rankings. A lot of eCommerce sites, and eBay’s own category pages are very thin on content. 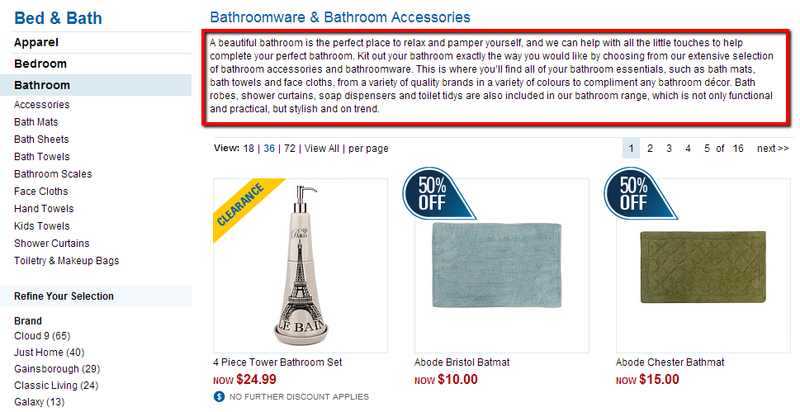 These pages generally list every product in the category with excerpts and details of each (which is not unique content) and little more on the page. For this reason, Google sees the pages as less valuable for the keyword phrase than other websites which go into more depth on the category and therefore have more chance of taking the top rankings. An example category page for eBay which has no content other than products. Losing a few rankings on pages that aren’t your product pages may not seem important, as after all it is your optimised product pages that will convert visitors to your site. However, this ignores one of the most important factors in SEO – search volumes. Whilst the conversion rates on direct product searches will definitely be higher than more general keywords the volumes are a lot lower. 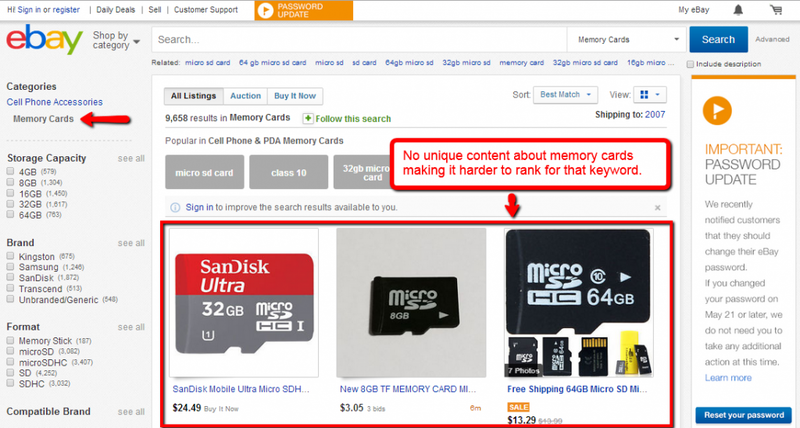 Having a page on your website that can rank for higher volume category based searches (such as ‘memory cards’ in the eBay example above) is very important and can bring a lot of traffic to the site, increasing sales. The large differences in keyword volume for category based vs product based keywords. Briscoes category page which contains unique content to allow the page to rank. There are may pages on your website that you can use this strategy on, including your brand pages, search result pages, your blog categories and many more. The main thing to remember is that you need a page on your site for each major keyword group or phrase you want to rank for and this content must be unique. On this website, I practice what I preach and have utilised both a description and a glossary on each of my main category pages which is currently helping me to rank – check one of them out here. It is important you act promptly to action these website changes as a Google update can come at any time. Case Study: Where Should Your Button Link To?